Three routes are compared by length, duration and hazards. 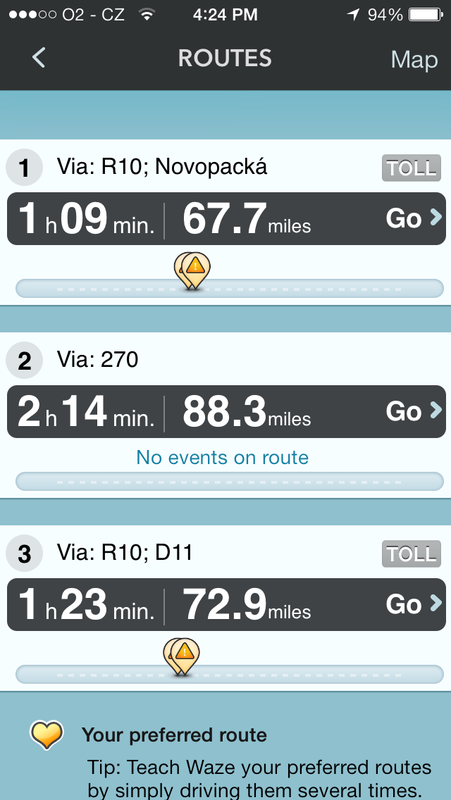 Waze is by no means new, but it really is handy for monitoring traffic. I started tracking my progress along Waze’s gamification system from peon => Grownup => Warrior => Knight => King. At the time I achieved the levels, they required 11,792 points, 21,894 points and 44,903 points respectively, according to my ‘points until next level’ and current point totals. Picking up points is pretty easy – in rural Virginia and the Czech Republic, there will often be Pac-Man like points on roads that are not frequently driven and where Waze wants to confirm their existence. In the Research Triangle Park area, my home base, people leave cars on the side of the road as if it were a hobby – each of these is an easy +6 / Hazard in the Waze system. My points accrued as follows, in what looks in hindsight like a pretty linear progression earning ~160 points a day (which means there is some automatic pointing sytem as there was no way I was making that many entries a day). Some friends have questioned whether or not it is safe to use Waze while driving, and this is a valid concern. Don’t use it if you are at all at risk of being a distracted driver. It is an easy, big-button UI approach to add hazards. My wife and I have actually made a game of it as we team-enter things on longer road trips where the passenger has made the entries. This entry was posted in Innovation, Invention and tagged Apps, Gamification, iOS, Mapping, Points, Traffic, Waze. Bookmark the permalink.